Top quality furnishings are not cheap, but with Smart Furniture promotion codes, coupons, and discount deals, you needn’t overpay. Just take a look for a SmartFurniture coupon code, free shipping deal, or sale offer that may save you big money on stylish furnishings for your home or office. Geeks know all about customizing computers and designing software to suit a particular need, but did you know that you can also get “design on demand” for your furniture? SmartFurniture.com’s Design on Demand has broken new ground by making it possible for customers to design furniture that is customized to their individual needs and preferences. Custom interior design is no longer merely for the wealthy or the artistic: Smart Furniture has brought it to everyone. They manufacture and sell their own line of award-winning Smart Shelves, but they also work with other reputable furniture makers, from Herman Miller and Knoll to Ekorness Stressless and Kartell, to provide a diverse assortment of furniture for use in the home and office. Other leading furniture brands on offer at the website include Blu Dot, Gus Modern, Skoby, BDI, Steelcase, Humanscale, Cherner, Calligaris, Cubitec, and SmartCubes. Customize your furniture products by selecting from a variety of furniture options, features, and fabrics that are one-of-a-kind. Browse an eclectic selection of shelves, chairs, sofas, desks, and tables. Purchase home organizers, entertainment centers, and furniture accessories. Get the right lighting for any room and discover affordable designs in furniture. To make it easier, you can also shop by room to locate the perfect living room furniture, bedroom furniture, or dining room furniture. Click on rooms ranging from small office or home office to apartments and lofts. Get patio and outdoor furniture as well as furniture for kids’ rooms. We’ve all heard of Bill Gates starting his computer empire in a garage. Well, Design on Demand also had such humble beginnings. It is a concept born in the mind of Stanford Law School professor Stephen Culp and initially conceived in a small workshop in his garage. Culp eventually made use of one of the first web-based design tools to offer a tool-free, customizable line of furniture. 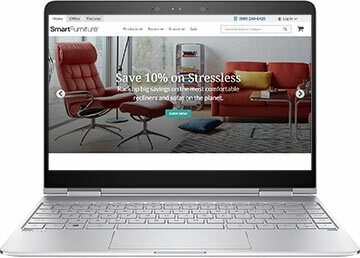 In a sense, SmartFurniture.com is the first furniture store truly designed for the Web, a fact techies will appreciate.